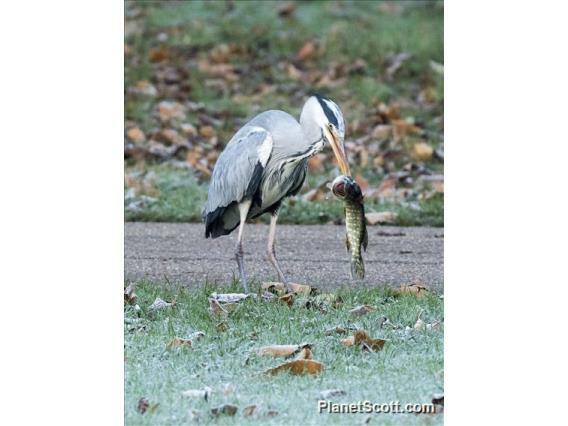 Grey herons feed on a wide range of prey items but are primarily piscivores. In addition to fish (Class Actinopterygii), their diet consists of insects (Class Insecta), crustaceans (Subphylum Crustacea), frogs (Class Amphibia) and small mammals. They sometimes even ingest tiny birds. Recent studies have documented grey herons attempting to prey upon and consume white-throated rails (Dryomnas cuvieri aldabranus). This is the largest bird species upon which grey herons attempt to prey. While it is not clear how often grey herons succeed in feeding on rails, injuries have been noted after feeding attempts. To locate food, grey herons wade through shallow water or move on land. They are thought to be most successful in capturing prey in the moonlight. Usually these herons stand still and wait for prey to approach in the water. They capture prey with their bills and generally swallow it whole, in one swift gulping action. Like other herons (Ardea species), grey herons in deeper water typically stand still on one foot and wait, sometimes for extended periods of time, for potential prey to swim near.